Coal production is significant to the economy of New Mexico, as the third largest source of revenues from mineral and energy production. Coal resources underly 12 percent (14.6 million acres) of the state, mostly in the northern areas of the San Juan and Raton basins. 46 percent of the state’s total energy needs are met through coal power. The average coal cost in New Mexico is high, for example in 1997 the average price per ton was $22.64 compared to $6 per ton for Wyoming. New Mexico lacks an integrated rail network and the ratio of seam thickness to mining, transportation, and health and safety costs, as well as the deregulation of the power industry, leads to this cost difference. Four Corners in the Crosshairs. Beginning in the 1850s, coal production and mining became important to the economic development of New Mexico. The first growth of the coal industry was driven by westward expansion and the development of the railroads, with yearly production first exceeding 1 million short tons in 1889. In 1918, this first cycle of coal production peaked at over 4 million short tons of coal. After World War I, production dropped continually through the depression of the 1920s and early 30s. By 1958, coal production had dropped to 86,000 short tons, in part due to cheap natural gas and the conversion of diesel engines by the railroad. In the 1960s, coal production began to increase due to the growing population of the Southwest and California. By 1997, annual coal production had reached 26.77 million short tons. The large surface mines of the San Juan Basin (McKinley, Navajo, and San Juan) began operating in the 1960s and 70s and are still used today. Coal Ash Contamination in New Mexico. Peabody Coal has operated two of the largest strip mines in the U.S. (the Kayenta and Black Mesa mines) on Black Mesa since 1965. Beginning in the 1970s, Peabody Coal Company pumped more than 4,500 acre-feet of Navajo and Hopi drinking water from the Navajo aquifer, in order to run their coal-slurry operations. The slurry was sent through a 273 mile pipeline from Black Mesa to northern Arizona and southern Nevada, where it was used to provide electricity to residents of California, Nevada, and Arizona. Between 1965 and 2004, Peabody used more than 60 percent of the Navajo Aquifer for industrial use. One of the impacts of draining billions of gallons of groundwater from the aquifer is the lowering of the water table. Reports from the U.S. Geological Survey and the National Resources Defense Council have shown that the Navajo Aquifer water table has dropped significantly and that it continues to deteriorate.Additional environmental damage has been done by the coal slurry pipeline breaking a number of times, resulting in the flooding and contaminating of lands and streambeds by hundreds of tons of slurry. In addition to the environmental impact, Navajo and Hopi people living on Black Mesa still do not have electricity or running water, which has led to charges of environmental racism and injustice. Opposition to coal in New Mexico has focused on the Desert Rock coal plant project. Desert Rock Energy Company, a Sithe Global Power subsidiary, has proposed to build a 1500 MW supercritical coal plant on Navajo lands in the four corners area of New Mexico near Farmington. The plant will burn low-sulfur, sub-bituminous coal. Diné Power Authority, a Navajo Nation enterprise established to develop natural resources on Navajo lands, has entered into a project agreement with Desert Rock Energy. The plant has significant opposition, including environmental organizations, local citizens, and legislators. 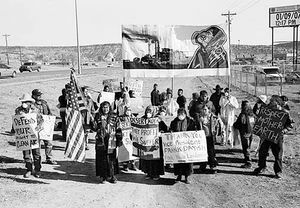 On December 12, 2006, members of the Diné tribe blockaded a road leading to the proposed plant site in protest of Sithe Global Energy's failure to fully consult with members of the community. Ten activists with the group Dooda Desert Rock set up a campsite on the road. On December 22, under threat of arrest, the campsite was moved to a nearby location, and company vehicles were once again able to access the site.Protestors were forcibly removed from the road by police on Dec. 22 , but established a nearby protest campsite and vigil that was still occupied as of Nov. 7, 2007. The air permit was approved in December 2006, and a draft environmental impact statement (EIS) was issued. At public hearings on the Draft EIS in late July 2007 in several cities in Navajo territory, hundreds of local residents expressed strong and vocal opposition to the plant. In July 2007, Diné CARE sued the federal Office of Surface Mining for approving an expansion of the BHP Navajo coal mine, which will fuel the plant; oral arguments in this case have been set for April 2008. On July 27, 2007, Gov. Richardson stated his opposition to the plant; on Aug. 22, the Mountain Ute Tribal Council unanimously passed a resolution opposing construction of the plant. In Sept. 2007, the U.S. EPA expressed concerns about the thoroughness of the Bureau of Indian Affairs draft environmental impact statement. In early May 2008, representatives of Diné Citizens Against Ruining Our Environment met with the upper management of Sithe Global to discuss the cumulative effects of the plant on the Navajo people, global warming, and the increase in construction costs of building the plant. Diné CARE presented Sithe with an alternative energy plan contrasting the development of the coal-fired plant with the ethical laws of the Navajo people directing them to live in harmony with the environment. While the opposition to the plant is significant, proponents of the plant refer to the importance of addressing the serious poverty and substandard living conditions for many of the Navajo Nation. Sithe has committed $5 million to capital improvements of impacted Navajo chapters. On Sept. 25, 2009, Desert Rock's PSD permit was remanded back to the EPA for reconsideration. In its decision, the EAB ruled that EPA Region 9, in its original approval of the plant's permit in 2006, had "abused its discretion" by declining to consider integrated gasification combined cycle (IGCC) technologies as part of its assessment of the best available control technologies for the facility. Due to this development, the timeline for the project will be significantly pushed out, as the permit will be subject to both agency analysis and another round of public comments. According to Sithe Executive Vice President Dirk Straussfeld, as of March 2010, there are no plans to resubmit the permit application since Sithe is in the process of evaluating its plans for the Desert Rock plant. The Navajo Nation is moving toward a clean energy future noted an October 2010 report in the New York Times. A grassroots movement within the tribe is seeking to replace coal power with wind and solar power alternatives. The Navajo Nation occupies all of northeastern Arizona, the southeastern portion of Utah, and northwestern New Mexico. 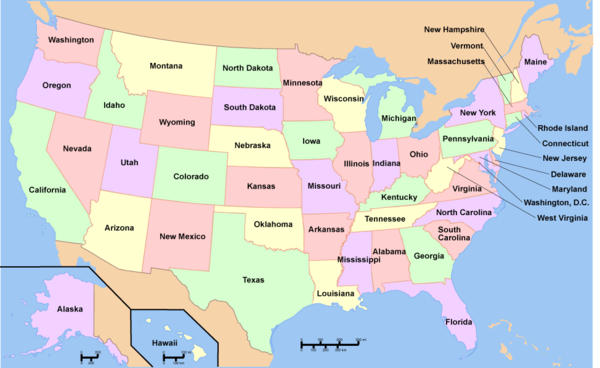 It is the largest land area assigned primarily to a Native American jurisdiction within the United States and has a population of 300,000 people. As of 2010 coal mines and coal-fired power plants on the Navajo Nation, as well as lands shared with the Hopi, accounted for 1,500 jobs and were a third of the tribe's annual operating budget, the largest source of revenue after government grants and taxes. The grassroots movement has sprouted as a reaction to the environmental and human costs of coal use. Two coal mines on the reservation have shut down since 2005. The Black Mesa coal mine ceased operations because the plant where the coal was burnt was shut down. Coal mined on Navajo land is used to produce power for the state of California, where greenhouse gas emission reductions have taken place. As such, many Navajo believe that coal is a fuel of the past. At the core of the movement is the belief that Navajo peoples ought not mine natural resources. Some Navajo spiritual guides have said that digging up the earth to retrieve resources is "tantamount to cutting skin and represents a betrayal of a duty to protect the land." According to a study conducted by Headwaters Economics based in Montana entitled "Fossil Fuel Extraction and Western Economics" reported that New Mexico coal production accounted for 10% of the total mining employment in the state in 2008. Oil and natural gas accounted for a combined 74% for the same year. New Mexico has 11 coal-fired generating units totaling 4,382 megawatts (MW). 10 of these units are larger than 50MW. In October 2010 the Environmental Protection Agency proposed pollution controls that would mean an 80 percent reduction in smog-causing nitrogen oxides from the Four Corners Power Plant on the Navajo Nation. EPA officials said their proposal would require Arizona Public Service Company to install selective catalytic reduction on all five of its operating units. Jared Blumenfeld, regional administrator for EPA's Region 9, said the Four Corners plant is the largest single source of nitrogen oxides in the United States. The proposed controls would reduce emissions of nitrogen oxides from about 45,000 tons per year to 9,000 tons per year, and improve both public health and visibility at 16 national park sites in the area, the EPA stated. As of 2010 there were approximately 4 active coal mines in New Mexico with production of approximately 20,991 short tons per year. ↑ 8.0 8.1 Desert Rock Energy Project, Sithe Global Power official site. ↑ Rep. Salazar Calls for Public Hearings On Desert Rock Power Plant Proposal, United States House of Representatives Press Release, April 24, 2007. ↑ “Protestors Blockade Desert Rock Site", Gallup Independent, December 13, 2006. ↑ “Resisters Move: No Arrests Made at Desert Rock’s Future Location", Gallup Independent, December 22, 2006. ↑ “Spiritual Gathering to Heal the Earth Begins Thursday", Gallup Independent, November 7, 2007. ↑ “Desert Rock Critics Flood Final Hearing", Navajo Timeson desert-rock-blog.com, September 26, 2007. ↑ “Judge Sets Timetable for Desert Rock Case", Durango Herald on desert-rock-blog.com, December 8, 2007. ↑ “Richardson Speaks Out Against Coal Plant", Associated Press on desert-rock-blog.com, September 27, 2007. ↑ “Mountain Utes Oppose Desert Rock", Durango Herald on desert-rock-blog.com, August 25, 2007. ↑ “Desert Rock Energy Project: Power Plant Document Concerns EPA", Santa Fe New Mexican, September 16, 2007. ↑ "EPA appeals board remands Desert Rock permit to agency", E&E News, Sept. 25, 2009. ↑ "The Death of Desert Rock? ", Laura Paskus, High Country Times, March 10, 2010. ↑ "Navajos Hope to Shift From Coal to Wind and Sun" Mireya Navarro, New York Times, October 25, 2010. ↑ Power Plants in New Mexico,accessed May 2008. ↑ ["SCE divesting of Four Corners; APS looks to buy share"] Kathy Helms, Gallup Independent" March 30, 2010. ↑ "EPA proposes nitrogen oxides reduction at NM plant" Sue Major Holmes, Bloomberg, October 7, 2010. This page was last edited on 16 March 2015, at 00:33.